That’s a lesser known Yoda quote. So, to truly become a Jedi, one must vanquish all germy-germs quickly and stylishly. 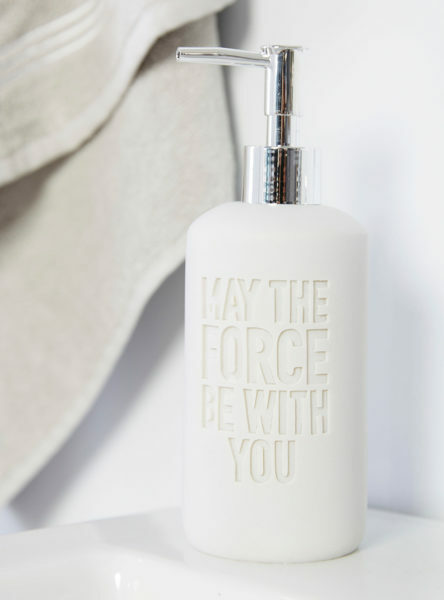 This May The Force Be With You Soap Dispenser, with its rad Rebel logo on the back, is just the thing to give your Jedi-In-Training so he or she can learn his or her way to the Light Side. Plus, there’s a matching R2-D2 Toothbrush Holder, Towel Set, Shower Curtain, Trash Can, and other fun bathroom accessories for Fans young and old. Save 25% on this set and other select Star Wars items when you enter code BLGIFTS at checkout. Hrmmm, this may be perfect for a friend’s little boy I know who is not fond of washing! I saw these at a store in the mall yesterday and they are so nice! Really chic looking but then they have this geeky twist. Love them.